Conforming to ASTM F 1807 black copper crimp ring specifications, RIDGIDÂ® Compact Series Pressing Jaws are available for crimping PEX and multi-layer tubing for radiant heat and potable water applications. Jaw ID clips, constructed of glass-filled nylon and marked with system and size information, facilitate identification of correct pressing jaw. 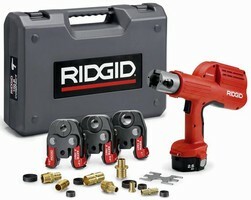 Available in 6 sizes from 3/8-1Â¼ in., products are designed for use with RIDGID Compact 100-B battery press tool. RIDGID Compact 100-B Pressing Tool Now Crimps PEX ASTM F 1807 Connections ELYRIA, OHIO - September 2006 - A new line of RIDGID® Compact Series Pressing Jaws is now available for crimping PEX and multi-layer tubing for radiant heat and potable water applications. These new jaws are used on PEX systems using ASTM F 1807 black copper crimp rings. The new RIDGID ASTM F 1807 Compact Series Pressing Jaws are designed for use with the RIDGID Compact 100-B battery press tool. The new ASTM F 1807 Compact Series Pressing Jaws feature new jaw I.D. clips constructed of durable, glass-filled nylon and marked with system and size information. The jaw I.D. clips enable users to quickly and easily identify the correct pressing jaw. The ASTM F 1807 Compact Series Pressing Jaws are available in six sizes: 3/8", 1/2", 5/8", 3/4", 1" and 1-1/4". Each jaw is offered individually, as well as in a three-jaw tool kit, consisting of a Compact 100-B tool, 1/2"-, 3/4"- and 1"-jaws, two batteries, a battery charger and a carrying case. The RIDGID Compact 100-B press tool is the most lightweight, compact, yet durable pressing tool offered by Ridge Tool. Weighing only 7.5 lbs., the Compact 100-B is powered by a 14.4-volt nickel metal hydride battery, allowing for use in extreme temperatures. The tool was designed for tight-space installations and features a 90-degree swivel barrel for more maneuverability when working around obstructions. The Compact 100-B is available with pressing jaws for use with 1/2" to 1" copper tubing connections as well as 3/8" to 1-1/2" Viega Pexcel PureFlow(TM) connections, a PEX tubing system that uses a different style of fittings. "This new line of Compact Series Pressing Jaws for PEX tubing installations increases speed and reliability, as well as reduces manual labor. The majority of connections are currently made with manual, bolt-cutter style crimping tools that are not as efficient," said Rick Henry, product manager of alternate joining technologies, Ridge Tool. "The RIDGID Compact 100-B tool now offers contractors a small, lightweight tool that can be used on 1/2" to 1" copper tubing as well as a 3/8" to 1-1/2" PEX tubing for multiple PEX systems." The RIDGID ASTM F 1807 Compact Series Jaws were designed to conform to ASTM F 1807 black copper crimp ring specifications. PEX tubing providers that offer the ASTM F 1807 copper crimp ring system include Vanguard Piping Systems, Inc. (Vanex®), Zurn Plumbing Products (Zurn®), Watts Water Technologies, Inc. (Watts®), Consolidated Plumbing Industries (DURA-PEX(TM)) and NIBCO (NEXT-Pure(TM)). Ridge Tool Company, a leading manufacturer of hand and power tools, markets its products in more than 130 countries. The company's broad offering includes threading and drain cleaning machines, and more than 300 types of tools serving the rental, plumbing, HVAC/R, industrial, electrical, petroleum, institutional, commercial and hardware markets. Ridge Tool is a subsidiary of St. Louis, Missouri-based Emerson. Emerson is a global leader in bringing technology and engineering together to provide innovative solutions to customers through its network power, process management, industrial automation, climate technologies, and appliance and tools businesses. For additional information on the new series of RIDGID manual PEX crimp tools, please visit www.ridgid.com, call toll free: 1-800-769-7743, or contact Ridge Tool Company, 400 Clark St., Elyria, Ohio 44035 U.S.A. ProPress® is a registered trademark of Viega Pureflow(TM) is a trademark of Viega. Vanex® is a registered trademark of Vanguard Piping Systems, Inc. Zurn® is a registered trademark of Zurn Plumbing Products. Watts® is a registered trademark of Watts Water Technologies, Inc. DURA-PEX(TM) is a trademark of Consolidated Plumbing Industries. NEXT-Pure(TM) is a trademark of NIBCO. Reader inquiries to: Ridge Tool Company, c/o Ultimate Lead, P.O. Box 739, Berea, OH 44017-0739. Or, call 1-800-769-7743 for more information.